The Standard Chartered Mumbai Marathon – What happened between 2010 and 2014? Singh is Kinng – my favourite pacers when I train or race! Most of those keen to compete against themselves in the Standard Chartered Mumbai Marathon (SCMM), held each year on the 3rd Sunday of January, will have submitted their registration by now – a few days after registration opened. Some will have registered for the first time, for others this will be a regular feature of their running calendar. A few months ago I shared, with friends, this graphic depicting the mean and median times of male and female runners in the ‘open category’ of the half marathon of 2014. The mean is simply the average of numbers. 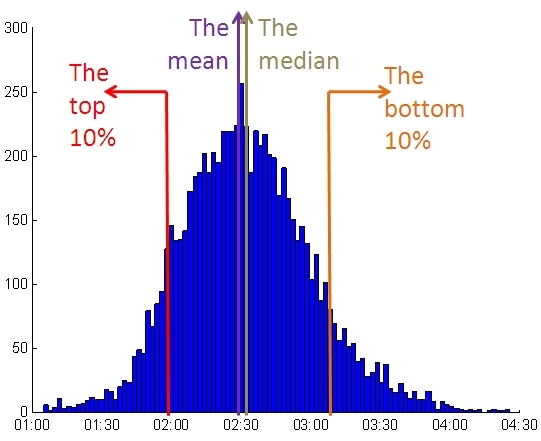 The median is ‘the middle one if you were to order them in order of size’ – ideal for comparing data where there are very large or tiny ‘outliers’ that might skew the average away from a fair representation of the typical candidate. Using the middle number, i.e. the median, as a representation often does a better job than the average. I was curious, as were others, as to what has happened in the last few years, say between 2010-2014 (5 Mumbai Marathons) for the various categories of non-elite runners. This short article is a fun words-and-pictures piece to give some colourful answers. A half marathon, even if walked at a stroll should be completed within 4.5 hours – the world record, when run, is 58 minutes 23 seconds. So, the first thing I did was remove records where the completion time was more than 4.5 hours. There were a tiny handful of records that were excluded as a result. The Number of Runners – Doubled! There has been a doubling of numbers running the half marathon over the 5 race-year period. Whatever be the reasons, the growth is encouraging even if absolute numbers are a tiny fraction of the city’s or country’s adult population. Average Racing Times – Younger isn’t always better! Median Racing Times – Younger is still not better! It’s great to see that completion times have been improving for all categories, on average, or for the ‘middle runner’. Here’s a pictorial representation of the slowest runner in the top 10% in each category, along with a representation of the number of runners in each category. 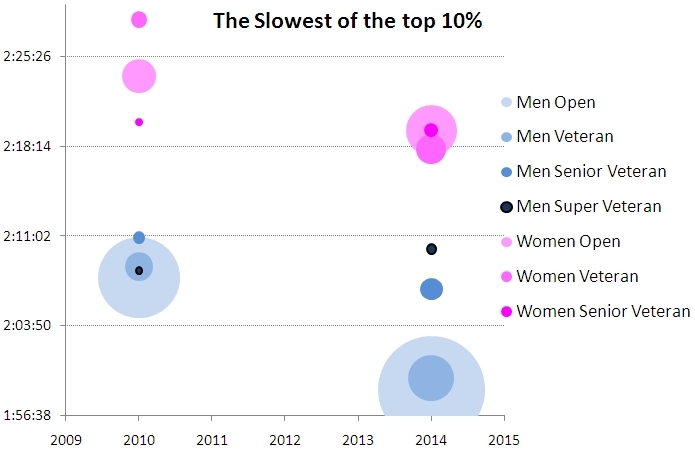 Interestingly, even as the sample size has grown larger, the slowest of the runners in the top 10% of the Women Veteran runners is still a little faster than her younger counterpart in the Women Open category! And, now the top 10% of men whether below age 45 (Men Open) or below 55 (Men Veteran) can finish within the golden “2 hour” time. One could analyze the data in more detail and test various hypotheses. For me the most simple observations are satisfying. As someone interested in making the world healthier, seeing such an improvement, albeit in just a tiny pocket of society is encouraging. Not only have the number of participants increased, but the overall level of fitness, when measured along this narrow dimension, has also increased. If it is true that the Standard Chartered Mumbai Marathon is a catalyst for improving the wellness of the city and beyond, may it continue to thrive. Previous Why does the son of a Hindu Brahmin fast during the Muslim month of Ramadhaan? Great piece of information….older generation seems to be challenging the younger one it seems…..
Drifting to healthier lifestyle by whatever means – running or any sport, eating consciously, taking stairs etc is always great. However, the only concern ‘now and in future’ is the commercialisation. 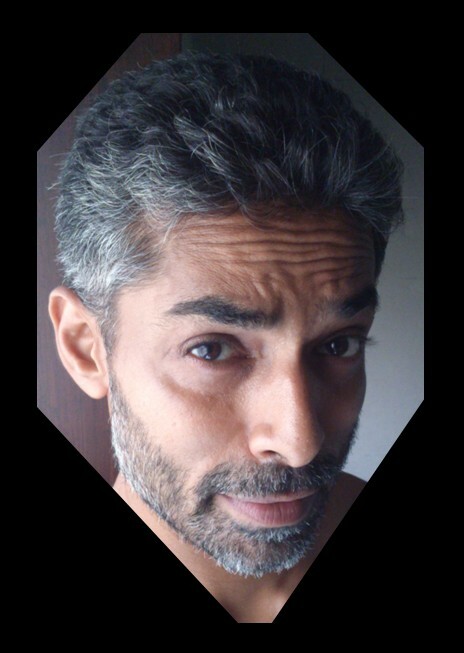 What I learnt from Puru The Guru is “if it can be measured…….then it can be managed” as I always see your articles with graphs that measures your lifestyle and then you tell us on how to manage it – in a positive way. Simply love your analytical skills. Thanks for sharing the details. Wow! Such details amazing!…..only YOU think this way Purnendu! You should send article to the SCMM to post on their website. Yes, it is certainly exciting to note the increase in people improving their lifestyle by taking up “Running” as their form of exercise. 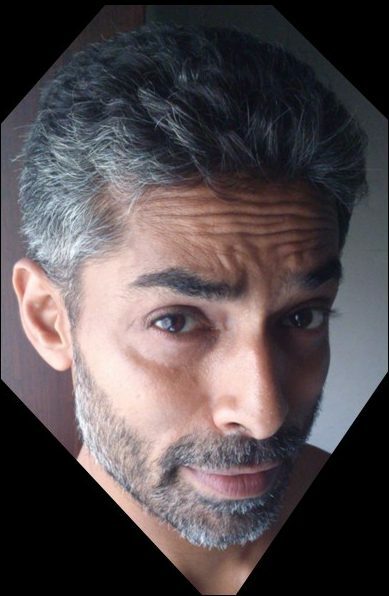 I can only well imagine the numbers when I run in the up coming SCMM ’15 for the 2nd time…..I hope I don’t get stampeded on:) Thanks for taking the time to share your insights and drawing us a birds eye view of this great event. Wow! Nice analysis! Seems like our older generation is out there to prove a point! Here’s to continued fitness and a healthy lifestyle!